2019 Maruti Suzuki Wagon R launched in India- What's New? 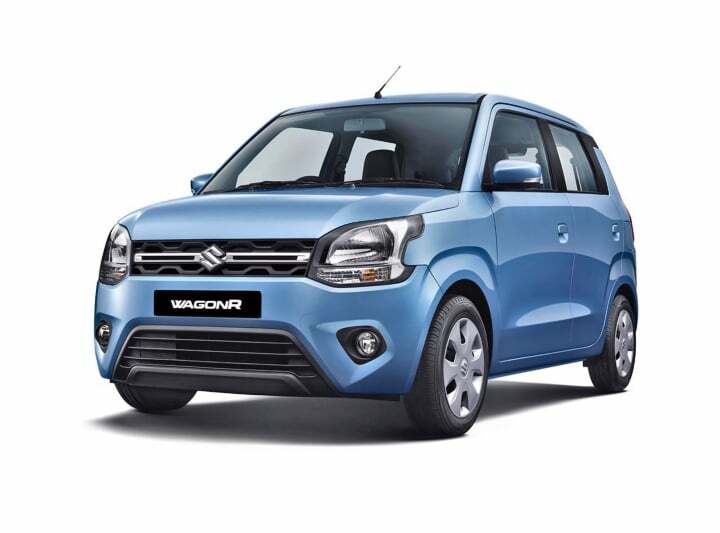 2019 Maruti Suzuki Wagon R launched in India- What’s New? The 2019 Maruti Suzuki Wagon R is available with two engine options, two transmission alternatives and retails in a total of seven different variants. The third generation of the Maruti Suzuki Wagon R has finally made its debut in India today. Available across a total of seven different variants, it falls in-between the price range of INR 4.19 lakh to INR 5.69 lakh (ex-showroom). The new Maruti Suzuki Wagon R has been launched with two different engine options. The base three variants are available with the current model’s 1.0-litre, 3-cylinder unit. This engine is capable of churning out 67 BHP along with 90 Nm of peak torque. The four mid and top-spec variants are available with Swift’s 1.2-litre, 4-cylinder engine which is good for 82 BHP along with 113 Nm of peak torque. Both the engine are available with 5-speed manual gearbox. However, certain variants also come with a 5-speed AMT unit. The 1.0-litre engine should offer a real-world mileage figure of 16-18 km/l. a similar figure is expected from the 1.2-litre engine as well. 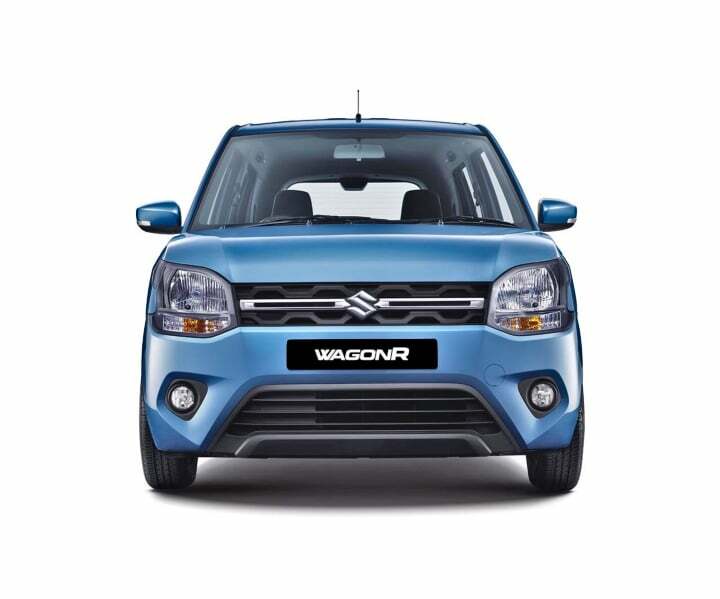 What helps increasing the mileage figures in comparison to the older generation model is the WagonR’s new lightweight HEARTECT platform. In addition to increasing its mileage figures, the same also offers better structural rigidity due to the use of high tensile steel. 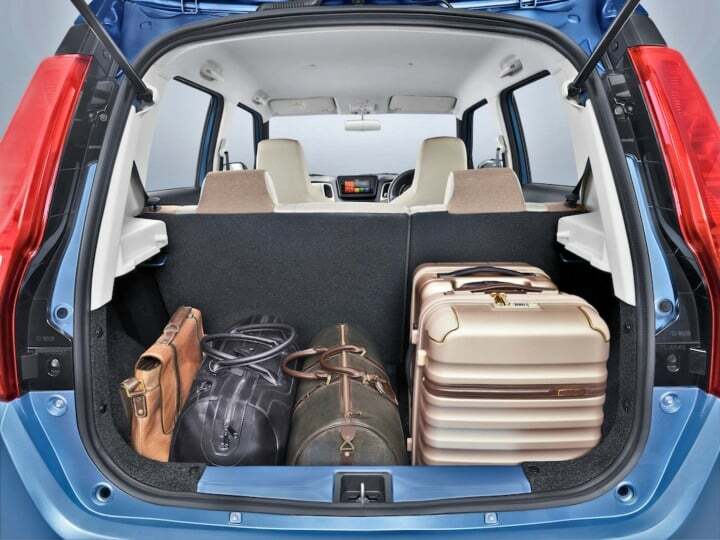 Furthermore, the platform has helped to increase the overall dimensions of the 2019 WagonR. This has resulted in more space on the inside, both for the passengers as well as their luggage. 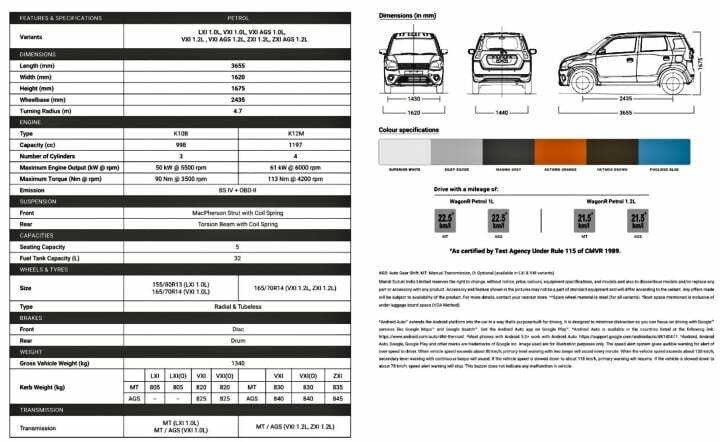 The 2019 Maruti Suzuki Wagon R measures 3,655 mm in length, 1,620 mm in width and 1,675 mm in height. Its wheelbase stands at 2,435 mm while the boot-capacity stands at 340-litres. The exterior design of the new Wagon R stays true to the car’s tall-boy stance. That said, the features are now rounded off with Maruti trying to give the car a more premium stance. The headlamps come with a slight kink at the edges, the bumper gets a clean design, the side profile now comes with a floating roof layout while there are large and longitudinal tail-lamps at the rear. 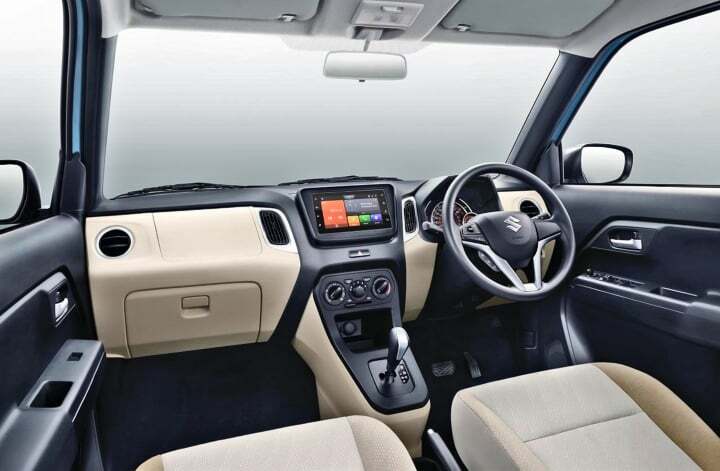 Inside, Maruti has completely revamped the layout of the dashboard as well as other panels. The dual-tone colour scheme gives a nice airy feel to the cabin. There are silver accents which add a bit of bling to the aesthetics. 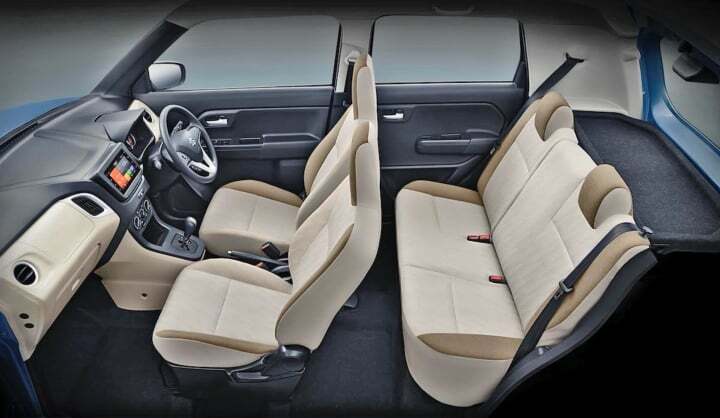 The seat comes with a beige upholstery while the rest of the panels get a black orientation. The 2019 Maruti Suzuki Wagon R comes with a sizable increase in its feature list. Top-spec variants will offer a 7-inch touchscreen infotainment system. 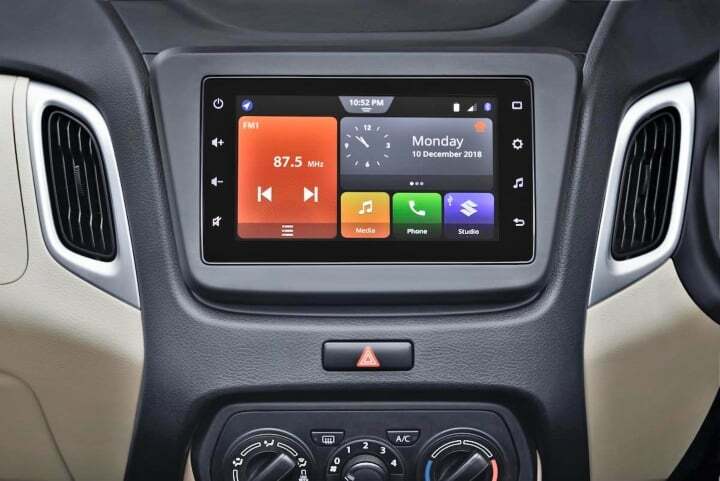 This unit is the same but with a different user interface as we have seen in other Maruti car of late. It comes with Android Auto and Apple Car Play connectivity. In addition to this, it comes with steering mounted audio controls, electrically operated ORVMs day and night IRVM, rear washer and wiper among other features. 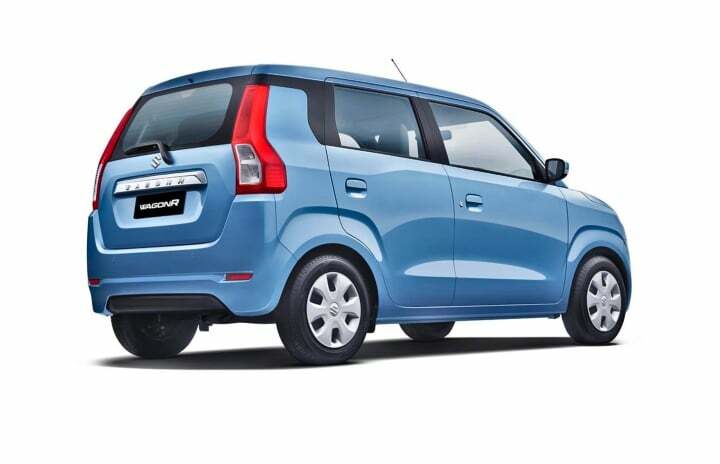 In terms of safety equipment, the 2019 Maruti Suzuki Wagon R comes with a driver side airbag, ABS along with EBD and rear parking sensors as standard across the range along with the high-speed alert system. 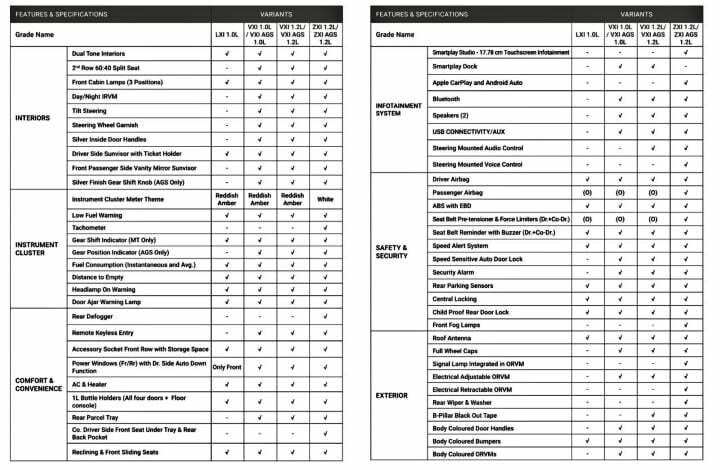 Top-spec variants also offer passenger side airbag along with rear parking camera with guidelines. 2019 Maruti Wagon R Interiors and Exteriors officially revealed- All You Need To Know!